Do you want to keep track of the photos in your archive? Then you can download MAGIX Photo Manager Deluxe now and test it for free – Organize your photos from start to finish. The high-performance features simplify and speed up every step in your digital photography workflow. You'll be ready for anything with a wide range of functions for image optimization, photo management, photo archiving and presentation creation. Take advantage of this opportunity to download and test MAGIX Photo Manager Deluxe for free. 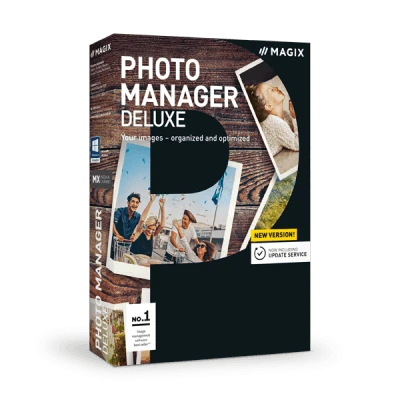 MAGIX Photo Manager Deluxe is a modern, clearly structured, high-performance photo management program. In one clearly designed interface MAGIX Photo Manager Deluxe combines everything you need for creating image archives, optimizing photos and presenting your slideshows on a PC or on the go. Use the program's various sorting functions to organize your video clips and photos in one easy step. High-performance correction techniques enable you to get the most out of your images. You can also keep the original files intact which allows you to experiment as much as you want with the effects. Optimize all of the photos in a folder in one go. You can easily apply changes to selected photos or all of the photos in a folder. This method delivers amazing results in record time.